This New Solidmounts Universal Articulating mount supports amazing 36" extension from the wall for most flat panel displays. The cantilever mounts offer maximum adjustability with a 36" Arm, including horizontal extension, 180º of lateral rotation, as well as full swivel and tilt capabilities. More than just mounting hardware, these cantilever mounts have a tactile quality that enhances the high technology aspects of any flat panel installation. With 36" extension, most TV units up to 75" can rotate easily. While TV can be extended up to 36" from the wall, The pivot point is about 32" from the wall, so a good rotation can be achieved up to 32" from wall. 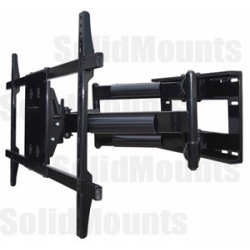 KEY FEATURES: •36" Extension Arm is the highest in industry •Dual Stud, Dual Arm Supports up to 200 lbs. •Solid Heavy-Gauge all steel Construction •Roll option to level the screen after Installation •Cable / Cord wire management •+15/-5 degrees tilt •TV extends 3.7" - 36" from the wall •Supports Hole pattern 800mm x 400mm (32" Horizontally x 16" Vertically) Other FEATURES: •Cantilever Dual arm mount for flat panel TV's •Allows maximum flexibility for installing and viewing your flat panel display •Arm allows extension and up to 180° lateral rotation for viewing from multiple locations (depending on Tv size) •Allows tilt and swivel for optimum viewing •Black Piano finish •Includes Universal wall Plate (no extra plate to purchase) •Easy To install •Mounting hardware Included Compatibility: •Ideal for 40", 42", 46", 50", 55", 60", 65", 70", 75", 80",82",85" and 86" LED TV Supports latest 70", 80" Sharp LED TV • Ideal for 42", 50", 55", 58", 60", 63", 64", 65" Plasma TV • Ideal for 40", 42", 46", 52", 55", 57", 60" LCD TV •Supports latest Sony 55" up to 85", LG 55" up to 86" LED TV •Supports latest Samsung 55" up to 85" LED TV •Supports Latest Panasonic 65" or Samsung 64" Plasma TV • Does not support Panasonic 85", Pioneer 60", older Panasonic 65" pf9, 10,11,12 For more information, please visit this products specsheet.